*You can order from both catalogues, no matter where you're located. It will simply influence your shipping cost and time. Medium-density fibreboard (MDF) is an engineered wood product. MDF is made by breaking down hardwood or softwood residuals into wood fibres and combining it with wax and a resin binder. Panels are then formed by applying high temperature and pressure. The end result is a aesthetic light beige panel with a fine texture. Furthermore, as previously said, Medium-Density Fibreboard (MDF) has a fine texture with a better surface quality that makes painting it easy. Painted MDF objects will have a great look. The price of manufacturing your MDF design is calculated automatically the moment it is placed online . It is calculated in an interactive way and depends on several factors such as the quantity of material being used, machine manufacturing time , and some logistic costs - to name a few . As you modify your object and utilize our optimization tools, you will note that the price changes automatically. To see the cost of your model in a few clicks, you can go ahead and upload your file . For laser cutting, we have two different catalogues: one for the materials we produce in our factory in France, and one for the ones we produce in our factory in the United States. According to whether you choose materials in either or both of those catalogues, your shipping time and cost will be modified. The time for cutting and engraving is approximately 2 working days for plywood produced in France, and 4 working days when it’s produced in the US. An additional period of 24 to 48 hours may be necessary depending on the size of your vector file. Based on the details of your engraving, the operation may take some time. The final time period is given on our website when you place your order. What about the manufacturing process of MDF boards? 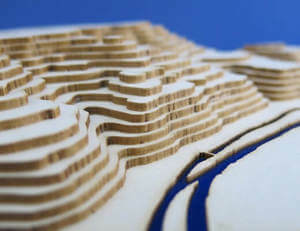 Laser Cutting is a digital subtractive fabrication technique that consists of cutting a material by means of a laser. 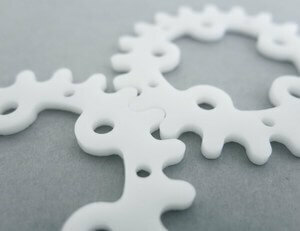 Laser Cutting can be used on a number of materials such as acrylic , wood , cardboard , etc. The process involves cutting material using a powerful and highly accurate laser that focuses on a small area of the material. The high power density results in rapid heating, melting and partial or complete vaporizing of the material. Usually, a computer directs the high-power laser at the material and traces the path. Laser Engraving (or Laser Etching) is a subtractive manufacturing method, that uses a laser beam to change the surface of an object. This process is mostly used to create images on the material, that may be seen at eye level. To do so, the laser creates high heat that will vaporize the matter, thus exposing cavities that will form the final image. This method is quick, as the material is removed with each pulse of the laser. It can be use on almost any kind of metal, plastic, wood, leather or glass surface. MDF, from a technical point of view, is a material that has several benefits, both on its ease of use and on its durability. The technical properties of MDF can vary depending on the thickness but will stay quite stable regarding expansion and contraction. When cutting, MDF is not subject to any cracks or any deformation and its tecture allows makes it easy to get a perfect cut. Moreover, it can be painted, stained, dyed, painted on, fireproofed, waterproofed, molded, lacquered, or curved. Unlike solid wood, MDF does not contain knots or rings, making it more uniform for planing or sanding. All these features explain why MDF is used notably in interior design and in the furniture industry. For instance, MDF is used to make solid wood furniture, such as a coffee table, garage doors, wardrobe doors, hand tools, wood screws, and any type of DIY projects, especially for home improvement where there's a need to replace real wood for saving money. Medium Density Fibreboard DF is easier to maintain than natural wood products. To clean your models, simply use a cleaning product, that has no ammonia or abrasive powder, with a damp cloth on the object. It is recommended to avoid rough cloths, scouring sponges, lacquer thinner, and aggressive cleaning products. For some projects, you might hesitate between MDF and plywood . There is one case in which you'll want to choose MDF: when you need parts to fit together tightly, and be assembled into a 3D shape. The fact is that the thickness for plywood is indicative, and may vary. Because MDF, on the contrary, is so stable, it will help you make sure your parts fit together correctly. However, engraving on plywood have more contrasts, so you might prefer plywood to MDF when it comes to engraving. There are multiple sizing and coloring options available through Sculpteo. However, colored MDF are only available in 8 mm sizes. It is also worth noting that an additional delay can ensue on standard 10 mm MDF and colored MDFs. Colored MDFs exhibit some additional characteristics compared to the raw MDF. They are waterproof, that is to say, they are resistant to moisture and can be used in kitchens, bathrooms, and for coatings. In addition, the colored MDFs have greater internal cohesion which gives them greater strength, on average 30% higher than the standard MDF. Your MDF object is originally light brown but can also be colored. The color is obtained by a process of dyeing in the mass the raw materials. Indeed, the fibers are dyed individually: they are impregnated with organic dyes and chemically bonded by a special resin. Hence the colored MDF keeps its color and does not require use of any painting. The dyes used are non-toxic, organic and environmentally friendly. MDF is a material that lends itself to different types of operations. Indeed, MDF can be painted, glued, varnished, dyed, painted, fireproofed, waterproofed, molded, lacquered, and, unlike solid wood, MDF does not contain knots or rings, making it more uniform for planing or sanding. For painting, for example, MDF lends itself well to either a solvent based paint , such as oil based paints, or a water-based paint, such as acrylic paint. MDF has a surface that absorbs the paint, it is best to apply a primer before painting the MDF. Bonding operations can be easily done with wood glue such as polyvinyl acetate, better known under the name of Elmer's glue. Thanks to the use of wood glue, you will create a great MDF product! 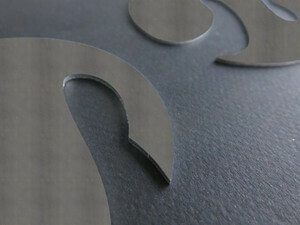 Laser cuts and engraves material by burning its surface. Therefore, the sides of the piece tend to be darkened, and are marked slightly on the edges. Sometimes, marks appear on the cutting line. The sides of the part cut in MDF might stain skin or clothes, as a thin layer of black wood powder remains on the part. The following chart lists the kerf sizes for MDF in function of the thickness. If you wish to make MDF pieces fit into each other and make sure they’ll stay connected, we recommend that you add in nodes. Nodes are small bumps situated in a piece’s slots or tabs, that allow to compensate the thickness variations of the material and the kerf. Nodes get compressed when the pieces are assembled and they concentrate the friction on specific points rather than on the slot’s whole surface. This way, the slots can be larger without coming apart, allowing the pieces to stay together.